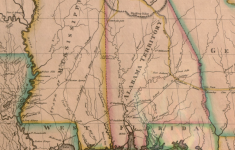 Prior to becoming the Alabama Territory on August 15, 1817, the whole area of Alabama was an immense wilderness, with American trading-posts on the east upon the Oconee, and those of Spain upon the south and west, while it was uninhabited by whites as far as the distant Cumberland settlements on the north. The most conspicuous and wealthy inhabitant of this neighborhood was Captain John Linder, a native of the Canton of Berne, in Switzerland. 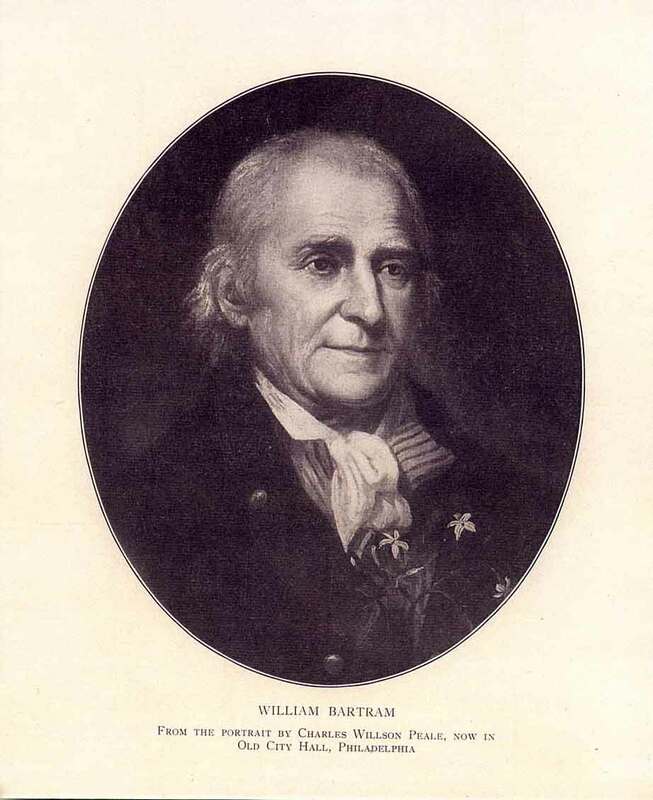 He resided many years in Charleston, as a British engineer and surveyor. There General McGillivray became acquainted with him, and during the revolution, assisted him in bringing his family and slaves to Alabama. The cultivation of cotton had also commenced, and some small machines had been invented for separating the lint from the seed. The French planters had some machines by which, it is said by Captain Barnard Roman, in his “Florida,” “seventy pounds of clear cotton can be made every day.” Whitney’s Cotton Gin was not invented until 1792. Pensacola, the capital of the province, contained in 1771 about one hundred and eighty houses, which were built of wood. This, as the seat of government, was to become the first place of traffic for the coming settlers of Clarke County. The French houses of the wealthy in Mobile were of brick. In 1775 the Thirteen United Colonies contained a population of about “three million people,” extending from New Hampshire to Georgia. 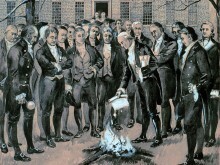 They were entering upon the American Revolution. West Florida did not enter this conflict so it became a secure retreat for Royalists, in the Carolinas and Georgia, who held themselves still loyal to the king of Great Britain. The banks of the Tombigbee river, then called Tombeckbee, became attractive to this large class of adventurers and refugees. In the year 1777 an English botanist, William Bartram, visited the settled parts of West Florida. He found on the Tensaw river many well-cultivated plantations, on which settlers were then living. His route both going and coming seems to have been on the east side of the Alabama. From him, therefore, nothing is learned concerning settlers on the west side. 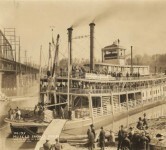 When near the northern boundary of the province and still beside the river, his party met with some Georgians, a man and his wife, some young children, one young woman and three young men, packing their goods on a dozen horses-who were on their way intending to settle upon the Alabama river, a few miles above its union with the Tombigbee And these “are believed” says Pickett “to have been among the first Anglo-Americans who settled in the present Baldwin county.” That some such settler had already reached the Tombigbee is quite certain, so that we may safely place the commencement of what became permanent American settlement as early as the year 1777. In 1777, some expeditionary trips by hopeful settlers through what is now Madison County occurred in north Alabama. Thomas Hutchins led a group into what was then the Indian Territory through Madison County towards Muscle Shoals. However, the Indians attacked and drove them from the area. Colonel John Donelson led a band of some 160 persons by Madison County along the Tennessee River to settle where Nashville, Tennessee stands today. Some of the men in the party were James Cain, Isaac Neely, Benjamin Porter, John White, and John Cotton. Joseph Martin and John Donelson, acting as agents of William Blount and Richard Caswell bought the Great Bend area of the Tennessee River from the Cherokee Indians. Griffin, Rutherford, Anthony Bledsoe and John Sevier joined Martin and Donelson in the venture. 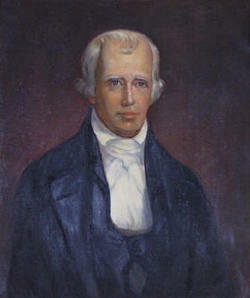 William Blount influenced the States of Georgia and North Carolina to create Houston county, to be governed by a commission of seven men that included Martin, Donelson and Sevier. Donelson was surveyor, Sevier was Milita Colonel Commandant and Martin became Indian Agent. Wade Hampton from South Carolina joined the group venture. In total, eighty men moved into the area of Muscle Shoals and Valentine Sevier was appointed as a member of the Georgia Legislature. However, two weeks after becoming settled in Muscle Shoals, they were forced out by the Indians. Colonel James Robertson attempted to make a settlement in Muscle Shoals in 1787, but was again forced out. 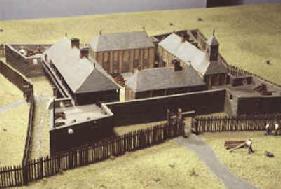 A third try was made by pioneer Zachariah Cox with an armed colony and managed to stay for two years before the Indians burned the block house and small village to the ground. Cox tried to settle in Muscle Shoals one more time but was again driven out. Read this story and more in ALABAMA FOOTPRINTS: Settlement: Lost & Forgotten Stories Books make great gifts! My great grandmother lived in a house similar to this. Hers had a breezeway in the middle. 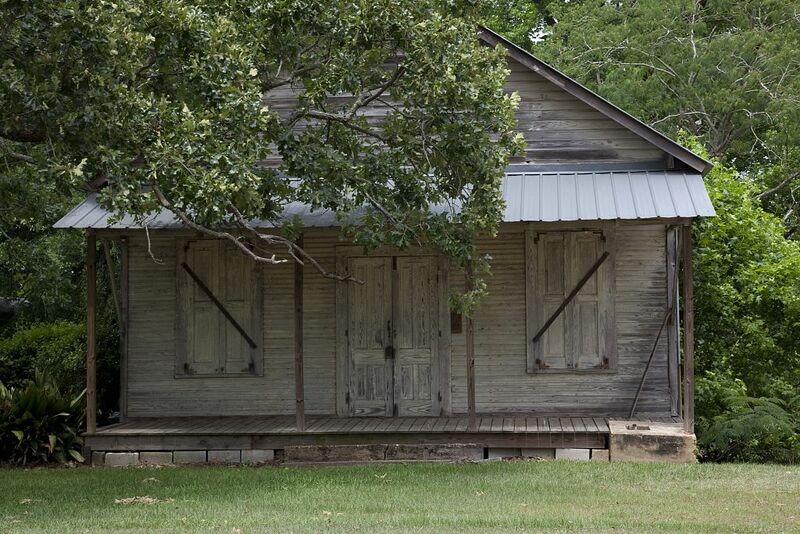 Me too: great-great-grandparents log cabin in Pintlala, Alabama. I have read a few of your post and I find they are omitting that most of these notable settlers forced Native Americans from their homes and took their crops! Most? Please state your sources. The Indian Removal Act wasn’t until well after 1817. Land was taken from groups who had been armed by the British during the War of 1812 and fought on their side. As far as I have studied early settlements post-1800 followed treaties. Yup sure did Angela Hubbard. One branch of our family, the Clapps of North Carolina, were among the first settlers in Madison Co., Mississippi Terr. after the Cherokee and Chickasaw Cession of 1806. Such a large number of settlers came, that by 1809 284 families were removed by the US government at the request of the Indians. I love old house.and old things. Is the “breezeway” mentioned the same as a “dog trot”? 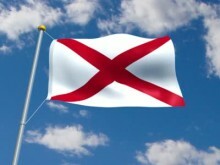 My earliest known ancestor and his brother were born in Alabama in 1805 & 1809 respectively. I’ve been trying to determine who their parents were and how they may have come to be in Alabama in 1805. Due to this time period being prior to the mass migration of settlers into Alabama after the Creek Indian wars, I am focusing on the Tombigbee and Tensaw settlements. One of my theories was that my ancestors parents were Loyalists escaping the revolution. Are there any sources that provide an overview of the makeup of these settlements around 1805 (loyalists versus patriots)?